Health journal ranks Oxford Health number three in top ten list of mental health trusts working to improve services. Health Business Insider, a magazine that examines administrative and commercial issues affecting healthcare, highlighted the work of our South Region Early Intervention in Psychosis team, which works intensively with young people who have had a psychotic episode for the first time. The team have also been shortlisted for the 2017 British Medical Journal awards, in the ‘Best Mental Health Team of the Year‘ category. 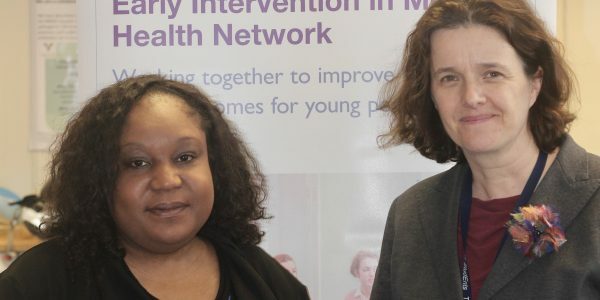 Earlier this year, a study led by team leader Dr Belinda Lennox (pictured, on right) found that these Early Intervention in Psychosis teams saved the NHS £4031 each year, for each person treated. If the service was rolled out across the whole country, this would mean that the NHS would save £33.5 million each year. As a result of our team’s efforts, all 16 Trusts across the South of England now meet the national target of everyone experiencing a first episode of psychosis receiving treatment within an early intervention team within 14 days of referral. Only 8 teams were meeting this target before the Oxford Health team’s intervention. As of October 2016, 83% of patients across the region are now assessed and treated within this 14 day target, a result that is the best in the country and which far exceeds the national target of 50%.